The Crossfade 2 have been certified to meet the Hi-Res Audio standards set by the Japan Audio Society (JAS) in wired mode. New dual-diaphragm 50mm drivers use a hi-resolution CCAS coil to achieve an extended frequency response of 5Hz to 40kHz—both well beyond the limits of human hearing. V-Moda says that in wired mode, users playing 24bit/96kHz or higher music files will experience increased dynamic range and more precise high frequency definition through the new Crossfade 2 headphones. Because the new headphones appear to have the same voicing as the previous generation, we would expect that the Crossfade 2 will retain V-Moda's signature bass response that we noted in our review of the original model. The Crossfade 2 Wireless are Hi-Res Audio certified, and the rose gold model supports the aptX codec. The Crossfade 2 have an impedance of 32 ohms and a sensitivity of 100db @ 1kHz 1mW, making them easy to drive with just about any mobile device. V-Moda claims that like their predecessors, the Crossfade 2 are voiced to sound the same whether plugged in or via Bluetooth. You can run the Crossfade 2 wirelessly up to 33-feet away (10-meters) from a Bluetooth source. The new rose gold model is the only version to add aptX codec support for near CD-quality, low latency audio streaming. Your Bluetooth streaming source must also support the aptX codec to get the full benefit. None of the models support the new aptX HD codec, which streams high-resolution music files over Bluetooth. The rose gold version with aptX support carries a $20 premium over the other models. V-Moda rose gold side view. A 430mAh battery is standard and rated to deliver more than 14 hours of music playback and/or phone calls. V-Moda says that the rechargeable lithium-ion battery is 15 percent bigger than the previous version. Plugging in the supplied 3.5mm cable instantly switches the headphones to pure analog mode. The Crossfade 2 can be fully recharged in around two and a half hours. The previous generation Crossfade Wireless headphones came with a nice carrying case, but were still bulky to carry around. The Crossfade 2 address the shortcoming of the original by introducing V-Moda’s patent-pending CliqFold design, which the company says folds the headphones down into a far smaller footprint that fits into a neat travel case. Like the previous generation, the travel case is designed with room to store charging and audio cables and other accessories. The new Crossfade 2 Wireless are foldable. The new model also adds vents, which V-Moda calls V-ports, that help the headphone circulate air in the headphone to let it breathe after you’ve worn them during a workout or a live performance. The Crossfade 2 not only come with larger ear pad cushions, but the cushions have also been enhanced with new memory foam that V-Moda says brings better comfort. We were excited to hear this upgrade to the included ear pads. As noted in our original Crossfade Wireless review, we preferred the optional memory-foam ear-pads to the foam pads that shipped with the unit. In addition to superior comfort, V-Moda claims that the new memory foam ear pads achieve excellent noise isolation—a claim that we are once again inclined to believe from previous experience. V-Moda has eschewed adopting active noise cancellation because it introduces background noise and adds extra pressure to the ears. Coming in at a relatively light 309g (assuming standard aluminum shields) we expect the Crossfade 2 to feel as light and comfortable as the original model. As with all V-Moda headphones, the new Crossfade 2 Wireless are fully compatible with V-Moda’s accessory ecosystem, which includes the BoomPro Mic; XL cushions; CoilPro cable; 1/3-button Speakeasy cables; and more. The headphones can also be personalized with 3D printing and 2D laser customizations from V-Moda’s web site. 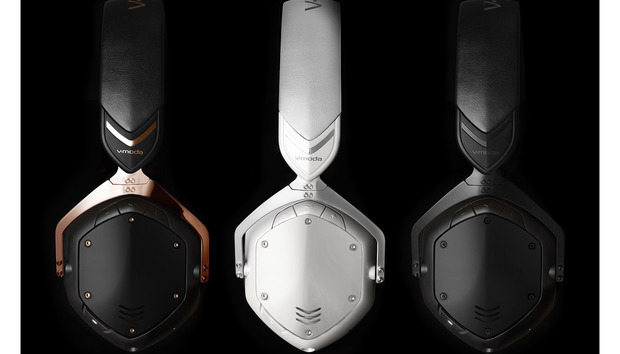 V-Moda's Crossfade 2 Wireless is now available in three colors optimized for personalization: Matte black ($330) which was not available with the original Crossfade; matte white ($330); and rose gold featuring Qualcomm aptX codec support ($350).